If you have ever been involved in an auto accident, you know how shaken up and emotional an accident can leave you. You may have been injured—perhaps even severely—or, your adrenaline may be so high that you are not even aware you were injured. Because of all these things, people often inadvertently make costly mistakes following their car accident. Consider the fact that there are more than 5 million car collisions reported to police each year, and that as a result of those crashes, there are more than 33,000 deaths and 2.2 million injuries. Admitting you were at fault for the accident. Never, ever, ever admit fault following an auto crash. First of all, you may not know all of the factors involved in the collision, so even if you think it was your fault, it really might not be. Second, once you have admitted fault, it can be very difficult to receive a fair settlement for your injuries and damages. Even saying “I’m sorry” to the other driver involved in the collision can be misconstrued as you admitting fault for the accident. The best thing you can do, after exchanging insurance information with the other driver, is to stop talking until you have a chance to discuss your case with an experienced personal injury attorney. Failing to call the police is another serious mistake you can make following a car accident. Far too often, one driver will attempt to dissuade the other from calling the police—usually the driver at fault. He or she may say there is not all that much damage, so why get the police involved. In fact, if you don’t call the police and obtain a police report, there is no one to independently back up your story. Further, if you don’t call the police and there is no police report, your insurance company may suspect you of attempting to cover up some kind of fraud. 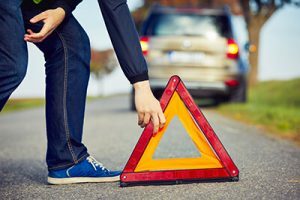 Failing to get sufficient information from the other driver following an auto accident is another common, yet serious mistake. At a minimum, you must obtain the names and addresses of all drivers and passengers involved, the license plate numbers, the other driver’s insurance information and driver’s license number, the make and model of each car, the name and/or badge number of the police officer who responds to the accident, and the contact information for any witnesses to the accident. Failing to take photographs at the scene of the accident is yet another serious mistake many people make. In this day and age of cell phones, nearly everyone has a camera on their phone. If you are physically able following your car collision, take photographs of each vehicle, as well as photos of the scene of the accident and anything else which might be important, and which will most certainly help your attorney build a solid case on your behalf. Failing to seek medical attention is a mistake made by many after an auto accident. Far too many people who have been involved in a car crash refuse to go to the hospital, saying they are “fine.” Maybe you actually are fine, or maybe you are more seriously injured than you realize. If you don’t go to the hospital, then later claim injuries, it can be extremely difficult to convince the insurance company to pay your medical bills. Failing to notify your own insurance company can also be a serious mistake. Even if it is absolutely obvious to everyone that the other driver was at fault, you still need to notify your own insurance company. You must also notify the other person’s insurance company as soon as possible. Some insurance companies have a set period of time in which you must file your claim, or you could be ineligible to receive payment for your injuries and auto repairs. Accepting the insurance adjuster’s first estimate without question, is another common mistake made by those who have been involved in a car collision. Remember, insurance companies are in the business to make money, and, despite the warm and fuzzy insurance commercials you see on television, the insurance adjuster is not your friend, nor does he or she really care whether your expenses related to the collision are covered. Having an experienced personal injury attorney by your side from start to finish will ensure you receive a fair settlement, so don’t try to handle the stressful aftermath of your accident on your own. If you or someone you love has been injured in a car accident that was caused by another person’s negligence, our attorneys can help. At the Rector Law Firm, our Colorado Springs personal injury attorneys have the experience and the resources to build a case that is designed to obtain maximum compensation for our clients. Call us today at 719-578-1106 for a free initial consultation and review of your case.